If your radiology practice thinks nurturing its relationship with the hospital you serve is a good idea, send one of your leader doctors to the hospital imaging department to ask this question: What can our group do to help with the imaging department's customer service efforts? Do this because there's a high likelihood that someone in the department—or further up in the hospital chain of command—is pushing some sort of organizational customer service effort. Why? First, consumerism is on the rise in health care. As deductibles rise and patients pay more out of pocket, they pay more attention to where their money goes. Second, competition is increasing in health care. And third, as health care reform allocates some portion of reimbursement to patient satisfaction, the topic is catching more executive attention. Medical marketing pros Tina Rudisill and Gail Schwartz, of TRG Marketing Works, referred to those three factors as consumerism, competition, and compensation—the three C's of change in imaging—in their presentation on wooing patients at AHRA 2015. It's hard to deny that trio. When Rudisill and Schwartz asked who was currently involved in a customer service effort, most of the attendees raised a hand. This is a thing. The trouble for some radiologists is that customer service and patient satisfaction frequently aren't quantifiable, hard-science things. 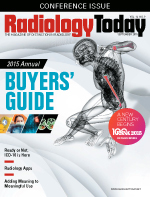 It's also true that diagnostic radiologists often don't have much contact with patients. Then again, referrers are your customers, too. Rudisill and Schwartz spoke of planning and creating a consistent customer or guest experience for imaging patients. One point that stuck with me: If a patient is getting a $1,500 MRI, shouldn't he or she have a $1,500 experience? To create that experience, Rudisill and Schwartz suggested using tactics from companies such as Ritz-Carlton Hotels and Starbucks; it was interesting stuff that seemed to make good sense. However, if the truth police interrogated me on the matter, I couldn't testify to the truth of it. The whole field can be a frustratingly soft science to data-driven radiologists. But it's absolutely true that the related topics of patient satisfaction and customer service are on the minds of hospital imaging administrators and their hospital bosses. If your hospital sees customer service as important, your radiology group's ongoing relationship with it will only be better served if you are seen as a contributing part of that effort.